La Tzoumaz, at an altitude of 1550m, is one of the true hidden gems of the Swiss Alps offering immediate access to the world famous Verbier’s ski area but with none of the queues. It is a peaceful, family resort with excellent ski conditions for all abilities where you will want to come back to again and again. La Tzoumaz is immediately adjacent to Verbier and shares the same lift system. The the new 8 man ultra-fast gondola to the top of the Savoleyres slopes is 800m from the chalet. This is also where the La Tzoumaz ski school is based. 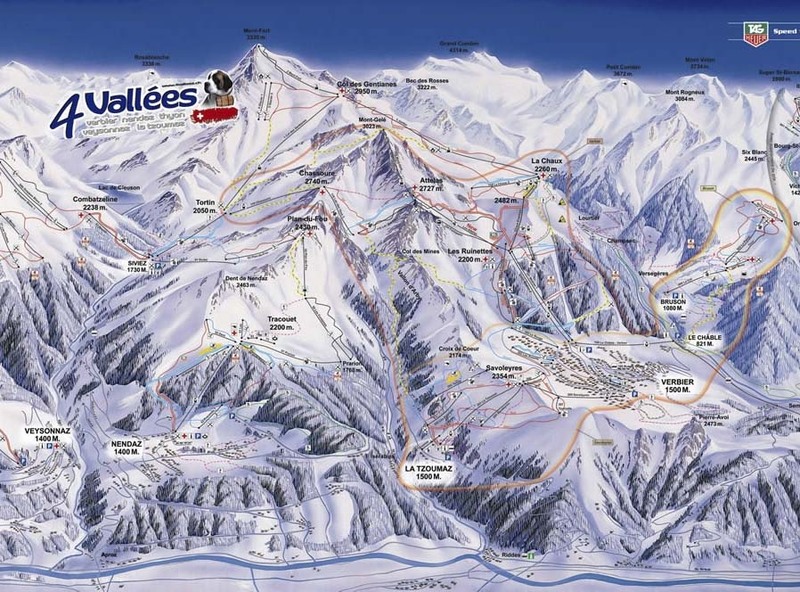 La Tzoumaz forms part of the "Four Valleys/4 vallées/quatre vallée" ski area, which consists of various ski resorts, including Verbier, Nendaz, Veysonnaz, La Tzoumaz, and Thyon. As such it has direct access to over 400 km of runs. Named after the word "tzoumer", which means taking a break, La Tzoumaz nestles against the same mountain as Verbier, Mont Savolyres, and is at the same altitude (1550m). La Tzoumaz is situated on North-facing slopes and hence enjoys a long ski-season, lasting from early December all the way through to late-April. The resort is perfect with families, with a small ski lift for children, a natural ice rink, a heated swimming pool and the longest sledge run in Western Switzerland (at 10 kilometers). A ride up the La Tzoumaz telecabin will bring you to the top of the Savoleyres in less than 8 minutes. From here there are several pistes that will lead you down on the Verbier side of the ridge. Our favourite is the red piste just over the top. Walk through the double-telecabin building past the sledges for hire and exit the building with Verbier-Savoleyres telecabin and the Savoleyres restaurant to your right. Just after you pass the bottom of the Savoleyres Sud drag-lift this route flattens out into a pleasant road that gently carries you to the Carrefour Restaurant. Just beyond you will see the Mayentzet chairlift, from where you are swiftly brought up to the large interchange area of Les Ruinettes. After any snowfall the road to the Carrefour restaurant is often closed due to avalanche risk from the sun-drenched hillside above, and the only alternative used to be the Pedestrian link (see below). This year there will be an alternative that avoids the bus ride! When you see the “Piste Closed” barriers near the bottom of the Savoleyres Sud drag-lift, simply follow the new piste down towards the Esserts drag lift. At the bottom of this lift there is a piste through the chalets linking to the Rouge drag-lift. Take the Rouge to the top and you will find yourself next to the Carrefour Restaurant, from where you can get to the Mayentzet chair up to Les Ruinettes. Returning to La Tzoumaz: After skiing down from the Ruinettes interchange to either the Carrefour Restaurant or the Medran base station, the free ski-bus brings you to the Savoleyres telecabin for the 11-minute ride home in this tiny, near-antique, 4-person cabin. If you don’t know where to get off the bus, keep a look out on the left-hand-side as the bus stop is on a roundabout in front of the 5-star luxury hotel and restaurant Chalet d’Adrien. Walk around the far side of the telecabin building as the entrance is at the rear. We always love the pistes home to La Tzoumaz from the Savoleyres summit. 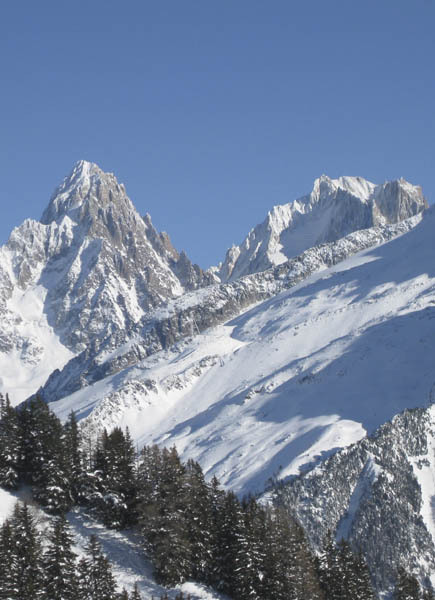 Experienced skiers can ski back via the famous Vallon D'Arbi, accessible from Lac de Vaux in Verbier.